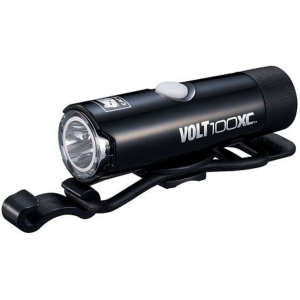 Whether you're burning the midnight oil at the office or bar hopping on a Saturday night, the CatEye Volt 100 XC Headlight provides 100 lumens of illumination, so you can pedal home safely on your commuter bike. This high-intensity LED light projects 100 lumens of bright illumination, with a solid beam and flashing light allowing you to navigate down dark streets and make your presence known to passing traffic. It secures to your handlebars with its rubber bar mount strap, ensuring a secure, stay-put fit without slipping or sliding during your ride. The rechargeable Li-ion battery lasts about an hour with its solid beam and up to five hours on flashing mode. Additionally, there's a low battery indicator so you're not left in the dark, as well as a memory function that turns the light back to its last setting used. And when it's time to charge it up, simply take off the end cap and plug in the USB stick into your computer's USB port or any USB wall adapter.